/ Havanese Pees When Excited: What to Do About It? If you have a Havanese puppy or a young one that is three years old and younger, there is a good chance that it does pee when excited. There are two main approaches for handling that matter. One is to simply ignore it and let the Havanese gradually outgrow it. That means that you don’t do anything special regrading that matter and very likely your puppy will no longer pee when excite after he turns two or three. That is actually not a bad approach if you don’t mind having to clean up the floor so frequently. But there’s actually a better approach you can try. The purpose of this blog post is to break down the simple approach into a few easy-to-follow steps. Let’s dive in now. First, you have to know what your Havanese looks like when he is excited. That should be very obvious for most Havanese. You can tell that they are trying to get your attention. Then you have to understand that there are different triggers that can get your Havanese excited. For a lot of dogs, the main trigger is when he sees when you are back home from outside. You can almost feel that he is trying to do everything that get your attention. For some other Havanese, he may be excited when you bring someone else to your home or bring certain food or toys along with you. Find out all the triggers if you want to help him improve. Now, knowing how your Havanese looks when he is calm is as important as the first step. I will very soon explain why in the following steps. One quick explanation is that you want to know what your Havanese looks like when he is calm and we only greet him or play with him when he is calm. By being calm, I don’t mean that he has to go back to his most quiet state. Instead, a slightly playful and cheerful state should be ok too but it’s different for very Havanese and there is no way that this training process is an exact Science. So, it is your duty to handle this trial and error process with open-mindedness. Okay, now you already know very well what your Havanese puppy looks like when he is excited and when he is calm. Let’s talk about the action to take. Very counter-intuitively, the action to take is basically to take no action. First thing I want to make sure you do is to not touch him. Remember, touch him can very easily make him get even more excited and that will cause him to pee. So, be discipline and don’t touch him when he is excited. 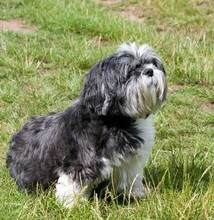 Of course, when your Havanese has finished learning not to pee when excited, feel free to play with him when excited. Just be disciplined during this process that may span over a few months. Another thing that you need to do when he is excited is to not talk to him. Just like humans, some Havanese are more sensitive to touches while some are more sensitive to sound, especially when the sound comes in the form of meaning words. I know it is hard not to talk to your cute little Havanese puppies especially when you see that he is begging for your attention, but we need to understand that we are trying to be seemingly stotic for good reasons. Making eye contact should also be avoided when he is exciting and looking for your attention. Not making eye contact is the hardest thing to do and it is also the one thing that is most easily forgotten in this whole training process. So, try your very best to remember not to make eye contact. You can look at other parts of his body just not the eyes. This step is very simple yet not easy. I am asking you to be patient. Yet it is a little against human nature to be patient. When your Havanese is barking cheerfully and inviting you to play with him, it is hard to be patient and wait for him to calm down. You, like your puppy, will need some training. Train yourself to be patient enough that you simply don’t make any eye contact with, talk to, or touch him before he calms down. As minutes go by, you will see him calm down eventually. When he has finally calmed down, you don’t want to just immediately raise your energy intensely and start playing with him. Instead, greet him gently and make everything very subtle and poise. It is nice if you can take him outside for a walk as a reward. Don’t make him overly excited, yet you can definitely make him happy. The toughest thing to do for this training process is the ability to handle our own emotions, not your Havanese’s emotion. It is super difficult to stay calm and rational when you know your puppy has been waiting for hours for you to get and home and is currently begging for your attention and the opportunity to play with you. Remember that many meaning processes in life are difficult and sometime painful. Just stick to the plan and execute it for a few weeks and decide if you want to continue to do that for a few extra months. That simple yet not easy training process does work for a lot of young Havanese that does have the problem of uncontrolled peeing when excited. Hopefully, this works for your Havanese too. The key is to be patient. Remember not to get angry when his pee is all over your home floor. We don’t get angry when our own babies pee and we should treat our Havanese like our very own babies.